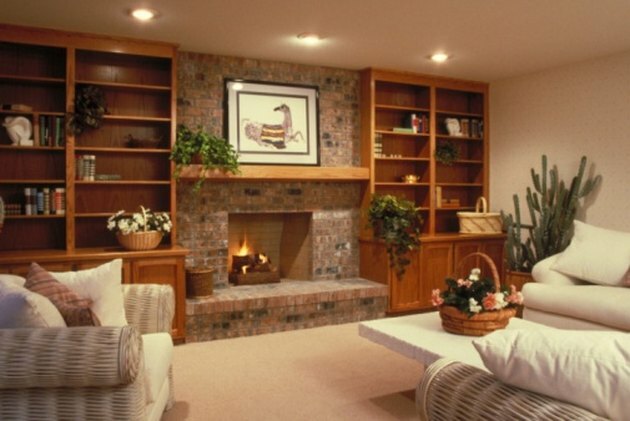 An entertainment center above a fireplace creates a cozy setting. Perhaps all that's missing is a shelf for DVDs, CDs or a few decorative accent pieces. If that is the case, this is just the right DIY project. 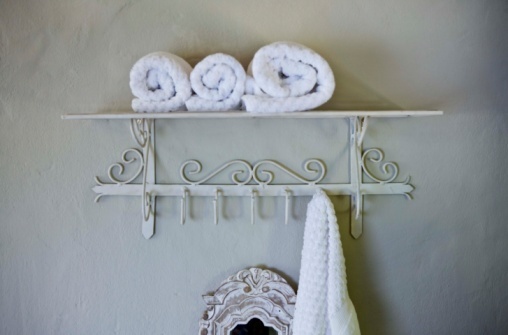 It's simple, inexpensive and you will have your shelf ready in no time. Celebrate the completion of your DIY project by making some s'mores in the fireplace and admiring your handiwork. Add a shelf to store DVDs, CDs and games. Measure the width and depth of the existing entertainment center. Use this measurement to determine the size for the shelf. Cut the wood for the shelf with a table or circular saw, according to your measurements. Sand and prime the wood. Follow with painting or staining so the shelf will blend in with the paint or wood finish of the existing entertainment unit. Allow the paint or stain to dry completely. Apply a protective sealant to stain. Use a marker and draw a line on the inside left wall to represent where you want the shelf to go. Make the mark close to the front of the unit. Measure the height of your mark line. If the shelf will be at the top, measure from the top of the unit down to the mark. If the shelf will be closer to the bottom, measure from the base of the existing unit up to your mark line. Use the height measurement to make guide marks on the rear left, rear right and front right side walls of the existing unit. You will use the four marks to determine where to place the brackets to hold the shelf. Turn the painted or stained shelf bottom-side up. Place the brackets two inches from the edges on the left and right sides. Stand the brackets up so they look like an "L." Take a marker and fill in the screw holes. Drill a pilot hole for each screw. Finish tightening each screw manually, using a screwdriver. Place the shelf inside of the unit. Use a stack of books (or a human helper) to elevate the shelf to the marker heights for the brackets. Take a marker and fill in the circles for the screws. Remove the shelf from the unit. Drill pilot holes for the screws on the front left and rear right, following your marker circles. Return the shelf inside of the unit. Use a screwdriver to screw in the top screw for the front left, and the top screw for the rear right. Without assistance from books or human hands, use a level to see if the shelf is even. Make adjustments if needed. Opt for the rear right screw if that's the case so you don't have visible screw "trials" at the front of the unit. Once you are sure of the position for the brackets, fill in the screw circles for the left rear and right front. Remove the shelf and the screws for the front left and rear right. Make the pilot holes for the left rear and right front. Return the shelf and completely screw in the screws for all four brackets to complete the shelf addition to your entertainment unit.